It represents four Women's Busts. 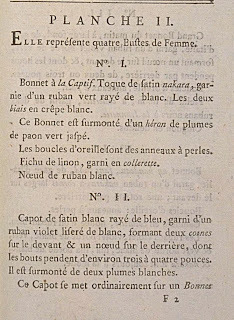 Cap à la Captif. Toque of nakara satin, trimmed with a green ribbon striped with white. The two veils in white crêpe. This Cap is surmounted by a héron of mottled green peacock feathers. Kerchief of linen, trimmed with a collarette. Capote of white satin striped with blue, trimmed with a violet ribbon bordered with white, forming two horns on the front and a bow in the back, whose ends hang around three or four inches long. 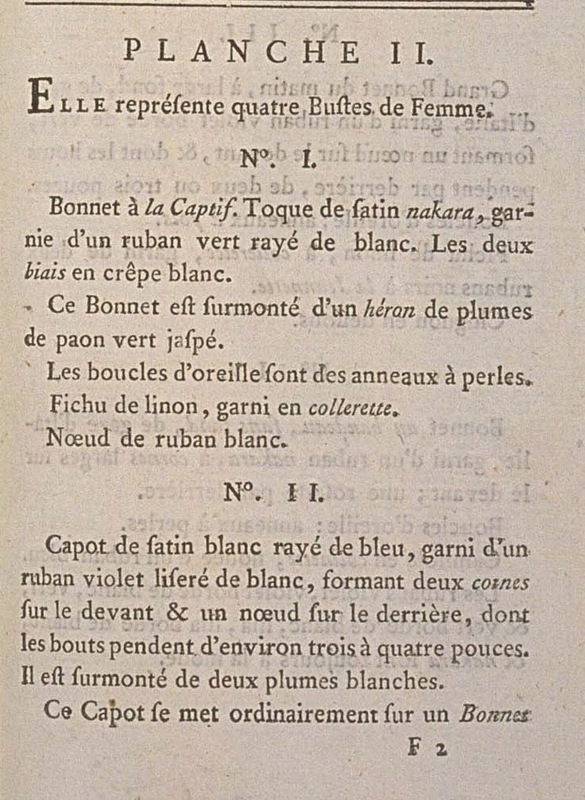 It is surmounted by two white plumes. 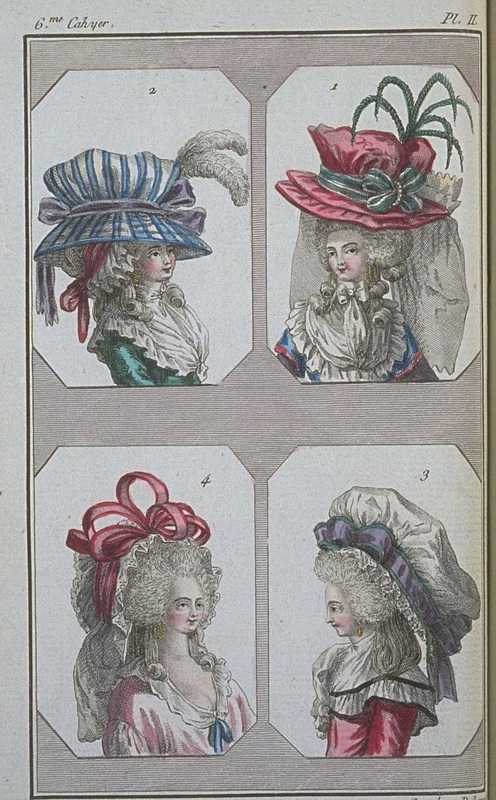 This Capote is usually worn on a round Cap or a négligé coiffure. The one represented here has for a bandeau a nakara ribbon. Kerchief of linen with a collarette. Large morning Cap, with a wide base, of Italian gauze, trimmed with a violet ribbon edged with green, forming a bow on the front, and whose ends hang in the back, for two or three inches. 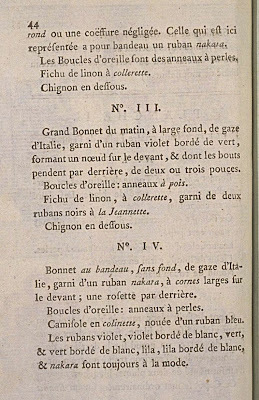 Kerchief of linen, with collerette, trimmed with two black ribbons à la Jeannette. 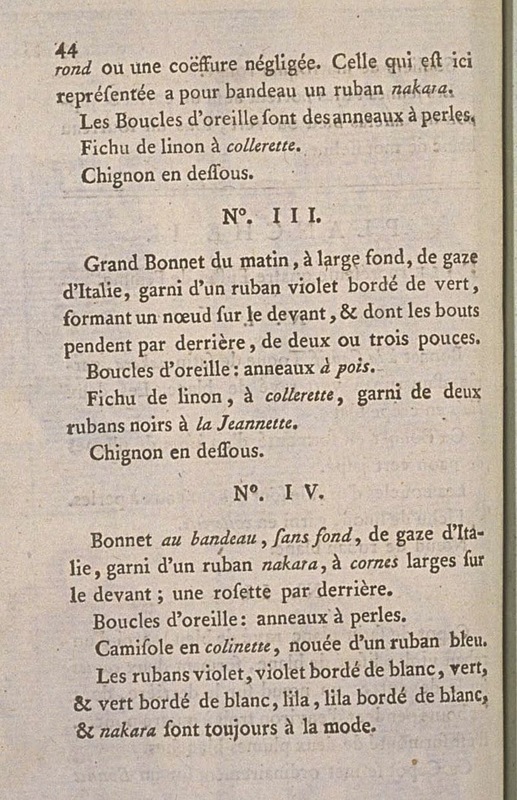 Cap à bandeau, without base, of Italian gauze, trimmed with a nakara ribbon, with wide horns in the front; a bow in the back. Camisole en colinette, tied with a blue ribbon. Violet, violet edged with white, green, and green edged with white, lilac, lilac edged with white, and nakara ribbons are still in fashion.